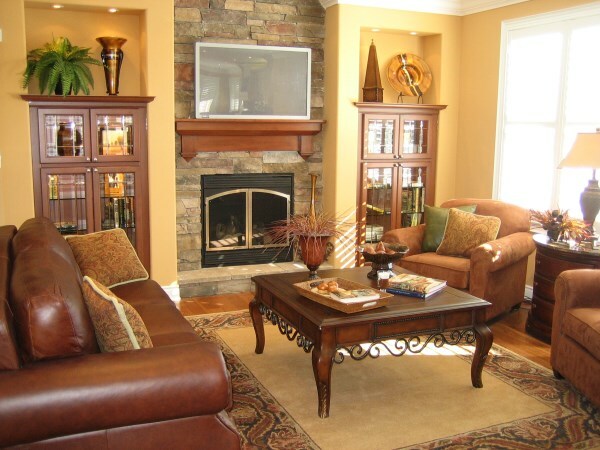 Living room with a warm paint color and cosy furnishings. Designing a room is always a fun challenge. However, choosing colors that work well together and bring out the best in the room can be daunting. The following trio of color tips makes choosing the right color a simple process. Since the wall color is the most noticeable color in the room, it is a good idea to keep it light. Light walls expand a room, whereas dark colors create the appearance of a smaller space. Test out wall colors in small patches before painting the entire room, so that you know what they will look like. Paint dries darker by at least a shade and the natural lighting in the room also effects the paint’s appearance. 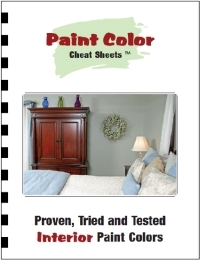 Most paint manufacturers now offer trial size paint specifically for this purpose. It is worth the extra expense to make sure that the paint will look great in the room. Floors also impact the primary color in the room. Instead of dark colors, opt for neutral, light colored floor coverings that will flow with the other shades in the room. The lighter floor color has the same affect that the lighter wall colors have in making the room appear larger. This is a great rule of thumb for decorating. Home decor magazines may be filled with the latest trendy colors for room decorating, but if your favorite color is blue and the magazines tell you to use red, the room will not turn out the way you had hoped. Being comfortable in a space is about being surrounded by the things that you like. The same is true for the colors in the room. Do not be afraid to use favorite colors to reflect your personality. If designing a room for someone else, always ask for their opinion before choosing colors. The room may be beautifully decorated, but if the homeowner dislikes the color scheme, the effort will be wasted. Color is a personal choice, so make it all about personality. The basic rule of thumb when decorating is that there should be no more than two patterns and four key colors in a room. Any more than this creates visual clutter and an uncomfortable feel to the room. Pick one neutral color and use the other colors as accents. If a patterned rug or pillow is chosen first, work the rest of the colors around it. Pull a light color from the pattern for the walls and floor, and use two or three others for the accents, furniture fabric or curtains. When dealing with colors and patterns, too much is not a good thing. Opt for a few key colors that create the look and feel desired, without adding visual chaos to the room. Designing a room with colors is easy to do when personal tastes are blended with natural lighting demands and patterns. Use color to express the interests and life of the people who will be spending the most time in the room. Balance and moderation will always be the keys to decorating with color when designing a room.